Our Proven Winners® 'Mocha Magic'™ Flower Combination is reminiscent of that decadent, super sweet, mocha latte with whipped cream and chocolate sprinkles that you might have indulged in! Starting with our Sweet Caroline™ Raven Ipomea, a.k.a. Sweet Potato vine, as the filler, we then add our Supertunia® White and Latte for architectural height and fluffy texture. 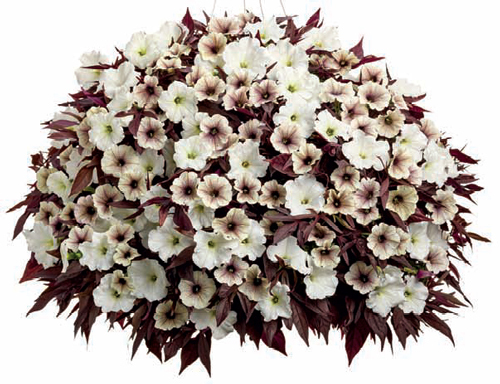 Our 'Proven Winners Mocha Magic' Flower Combinations are grown and shipped in fine quality growing medium and are guaranteed to arrive alive and ready to thrive. Comment: I bought these for the diversity of color which matches my house perfectly. I am still waiting for the White Russians to show through, so far it just looks like I have White Petunias with Sweet Caroline. They are still coming in full, but not with as much color I would have liked.